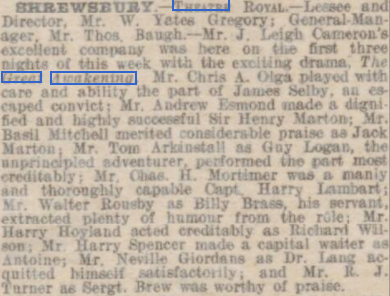 From The Shrewsbury Chronicle, 25 March 1910. From The Era of 2 April, 1910. From The Era 16 April 1910. SEACOMBE.— King’s Theatre —Proprietor and Manager, Mr. James Kiernan. —Miss Olga Andre’s company is here this week with "The Great Awakening". Mr. Chris A. Olgar does well as James Selby; and Mr. Basil Mitchell gets in some capital heavy work as Jack Merton; Miss Ethel Tooney proves her worth as an emotional actress; and Miss Hetty Farrell! sustains the lighter portions in conjunction with Mr. Walter as Billy Brass. Mr. Charles H. Mortimer acts strongly as Capt. Harry Lambert; Mr. Tom Arkinstall scores Guy Logan; and Miss Olga Andre is successful as Lola Selby. From The Era of 23 April. 1910. SALFORD.-P.O.W - Proprietor and Manager, Mr. E. B. Goulden; Acting-Manager. Mr. Harold Goulden. The Great Awakening is here again and doing well. Miss Olga Andre makes a great impression as Lola Selby; James Selby is well played by Mr. Chris. 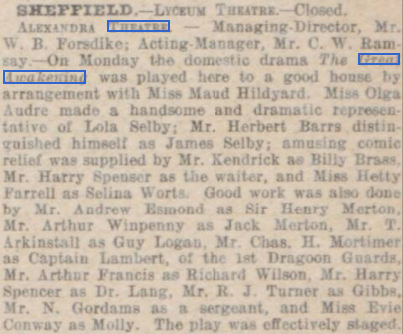 A. Olgar; Captain Harry Lambert is carefully handled by Mr. Charles H. Mortimer; Mr. T. Arkinstall is a capable Guy Logan; the comedy business is well presented by Mr. Walter Rousby as Billy Brass and Miss H. Farrell as Selina Worts; Miss Florence Zillwood is a charming heroine as Molly Merton; Mr. Andrew Esmond as Sir Henry Merton, Mr. Basil Mitchell as Jack Merton, Mr. Harry Hoyland as Richard Wilson, and the other members of the company do efficient work. From The Scotsman, 5 May, 1910. From The Scotsman of 3 May, 1910. From The Era of 14 May, 1910. 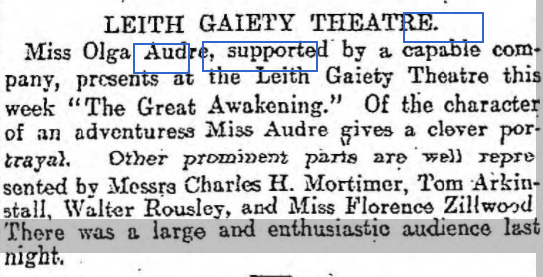 SPENNYMOOR.— Cambridge Theatre— Lessee and Manager, Mr. Hugh Robertson; Resident-Manager, Mr. David Collins.—Miss Olga Andre and her company give a good representation "The Great Awakening". Mr. Tom Arkinstall undertakes the part of Guy Logan ably; and in that the hero Mr. Wood is seen advantage. Mr. Arthur Wimpenny as James Selby performs well; and Mr. Charles H. Mortimer is very good as Captain Harry Lambart. The success of the piece is the powerful work of Miss Olga Andre, an actress of a high order, as Lola Selby. Miss Florence Zillwood gives a careful study of the role Molly Merton; and Miss Hetty Farrell as Selina Worts creates much amusement. From The Era of 21 May, 1910. 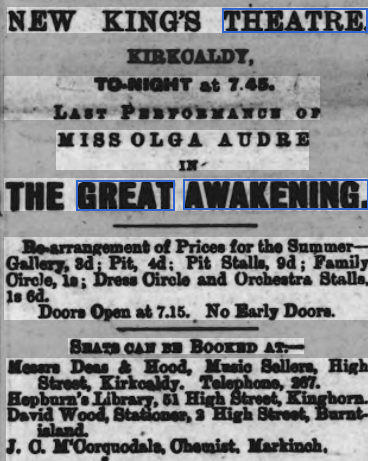 KIRKCALDY.— New King’s Theatre.—Proprietors, Messrs. Ellis Fredericks and Abrahams.—Miss Olga Andre and company are presenting The Great Awakening. Mr. Tom Arkinstall gives a clever display of stage villainy as Guy Logan; Mr. Charles H. Mortimer is very good as Captain Harry Lambert; Mr. Arthur Wimpenny is a success as James Selby; and Mr. Fred Wood is versatile in a dual part; Miss Olga Andre enacts Lola Selby with skill and taste; Molly Merton is pleasingly portrayed by Miss Florence Zillwood; and in the comedy parts of Billy Brass and Selina Worts, Mr. Walter Rouseby and Miss Hetty Farrell are amusing; Mr. Harry Hoyland does well as Richard Wilson. From The Yorkshire Evening Post of 4 June, 1910. 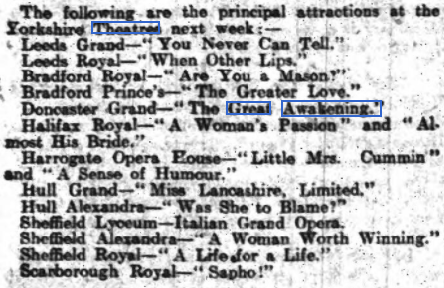 From The Yorkshire Evening Post, 11 June, 1910. ​From The Era of 25 June, 1910. ACCRINGTON. -Prince’s Theatre— Proprietor and Manager, Mr. J. 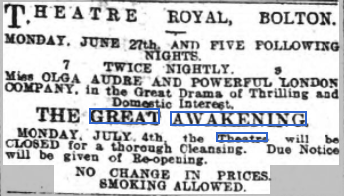 B. Ormerod; Acting-Manager, Mr. J. E. Barnes.—Miss Olga Audre and company are here with "The Great Awakening". Miss Olga Audre creates a deep impression by her finished embodiment of Lola Selby; Mr. Herbert Barrs is a powerful James Selby; Mr. Charles H. Mortimer a vigorous and manly Captain Lambart; Mr. Tom Arkinstall is admirably suited as Guy Logan; Mr. Andrew Esmond is remarkably good as Sir Henry Merton; and Mr. Arthur Wimpony capably plays Jack Merton. Mr. Ernest Kendrick is a quaint Billy Brass; Miss Dorothy Oswald a bright and attractive Selina; and Miss Evie Conway a pleasing and unassuming Molly Merton. From the Bolton Evening News of 1 July, 1910. From The Yorkshire Evening Post of 14 July, 1910. 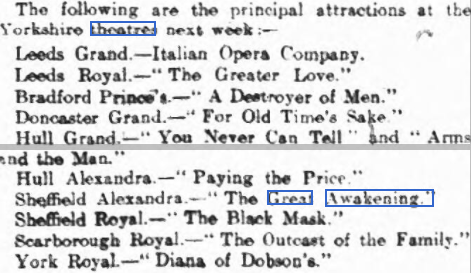 The Stage - Thursday 07 July 1910.This shows that Charles' time in this production was coming to an end.